In 1943, Charles and Ray Eames collaborated with John Entenza, Buckminster Fuller and Herbert Matter on a special issue of Art & Architecture that was devoted to the impact of prefabrication, industrialization and mass-production on the design of housing. Published in July 1944, at a time when the production of the Quonset hut was in full swing, this was a response to an anticipated post-war housing shortage and sought to capitalize on new industrial technologies and ways of working. It presented the house alongside conspicuous images of other mass-produced domestic products - the toaster, iron, telephone and pressure cooker - as well as production lines of trucks and airplane parts. "The architects of the prefabricated house" it suggested "must be the student of human behavior, the scientist, the economist and the industrial engineer." 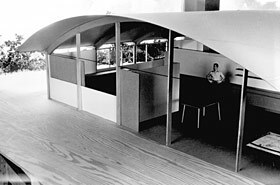 In that same issue the magazine also highlighted the Quonset hut in a review of emergency shelters that encouraged a new approach to design and in a subsequent issue in December 1946 Art & Architecture urged its readers to "look at the Quonset again with a more analytical attitude and an open mind.let's stop thinking of the Quonset as a stop-gap emergency shelter or as a poor relation to a real house". These ideas continued to influence Charles Eames, Eero Saarinen and numerous other designers, and in 1945 a group of architects were commissioned to design a series of influential houses using steel and glass for the Case Study House program initiated by John Entenza and Art & Architecture. Although the houses that were designed and built in California as a part of this program now have the status of cult objects, at the time they were seen as "capable of duplication and in no sense be an 'individual' performance". Buckminster Fuller had explored duplication and the use of prefabricated metal components to construct lightweight buildings prior to the outbreak of World War II. His design for the Dymaxion House in 1927, which proposed a hexagonal shaped metal structure suspended from a central mast that also housed all of the equipment for the kitchen, laundry and servicing of the house, advocated the use of factory made metal components and his interest in the potential of industry to assist in the production of the house was further advanced through his collaboration with Emanuel Norquist of the Butler Manufacturing Company. Together they developed the Dymaxion Deployment Unit - a low cost house that was designed to capitalize on the potential of metal and benefit from the expertise in working with that material that the Butler Manufacturing Company had acquired since its founding in 1902. The company was the largest general metal sheet fabricator in America at the time and their experience, first from manufacturing steel livestock watering tanks and subsequently constructing grain bins and storage buildings using both corrugated metal sheet and pressed metal panel systems, proved to be invaluable. It inspired the designer and the industrialist to devise and build a prototype circular housing unit in response to the government's interest and a pressing need for wartime housing. The prototype passed final government inspection in 1941 and three plants were committed to produce 1,000 Dymaxion Units daily, each at a cost of $1200. However, as the government was unable to divert enough steel from the war effort for the project, the few hundred units that were built were used by the U.S. Army for housing for the Signal Corps and also for operating rooms. However, Fuller's ideas had challenged the concept of a frame structure by articulating an option in which the shape of the building and the use of standardized curved corrugated metal sheets for the external wall and pressed steel roof panels created an envelope that also served as the structure. There were numerous other efforts by architects and industrialists to utilize the new knowledge that became available during World War II. Louis Kahn, I.M.Pei, Richard Neutra, Edward Larabee Barnes, Ralph Rapson, Henry Dreyfuss and many others developed projects that were aimed at capitalizing on that knowledge by using different materials and creatinng new building systems. Later designs, like the prototype for Fuller's Dymaxion Wichita House that was built in 1947, were developed in an attempt to use new materials--predominantly metal--and redirect the expertise and facilities at former wartime factories and assembly plants. Each of these schemes, preoccupied by lightness, improvisation and the potential of these new materials and processes, advanced ideas for prefabricated housing in ways that sought to create innovative, mass-produced and inexpensive models for the future.